London stage actor confirmed as new companion. The BBC has officially announced that actor and singer Pearl Mackie is the new Doctor Who companion taking over from Jenna Coleman. Mackie – who is currently appearing in the National Theatre production of The Curious Incident of the Dog in the Night-Time and has previously been in BBC’s daytime soap Doctors – will join Peter Capaldi in the Tardis as Bill when the series returns to BBC One in 2017. Announced during the live FA Cup Semi-Final, the new chatty companion is shown trying to escape a Dalek with the Doctor while inundating him with questions. 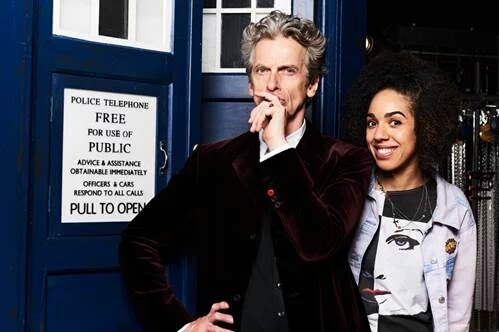 Brixton born Pearl Mackie will not appear in the 2016 Christmas Special but will make her debut in Doctor Who Series 10 in 2017. “Peter Capaldi is such a brilliant actor, and his Doctor is such a wacky and wonderful character, I can’t wait to see what adventures are in store for him and Bill throughout time and space.